Leslie and I first met when we showed together almost exactly a year ago, but I had in the months prior to that already been checking out her website and getting to know her fascinating work. I love work that surprises me and makes me think in a different way, and that is exactly what she achieves. And I am obsessed when work can’t quite be defined as one thing. 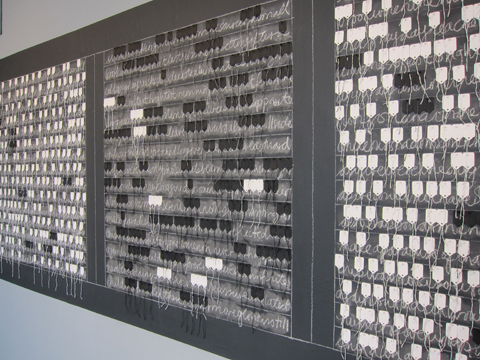 It’s drawing, it’s installation, it’s fiber…it’s amazing. I hope you enjoy getting to know more about her work and process as much as I have! My love of language comes from my family, from growing up in a home where more than one language was spoken. My father’s native language was Dari, a dialect of Persian spoken in Afghanistan. I did not learn it as a child, but did learn many words and phrases, and developed a fascination with and respect for the multiple ways one might express oneself. I have studied many languages, including Persian, Portuguese, French, Italian, and Latin, but Spanish is the only language other than English that I feel I can speak somewhat fluently. My favorite words change frequently. I do enjoy pondering common words, and the way in which their meanings might be distributed in different languages. For example, in English, there is one verb “to be,” while in Spanish, the meanings encompassed in that one English verb are expressed in two verbs: “ser” and “estar.” As a teacher of Spanish to English speakers, that is one of my favorite points of grammar, and one that I have also enjoyed exploring through my work. It is so essential (! ), and beautiful to contemplate. One of the things I loved learning about your work was the rhythmic aspect to it as well. It wasn't just the words or double meanings language can provide, but it was the way in which we say them, the sounds themselves that come out of our mouths. I found it fascinating. Can you describe that a little, how and why this aspect came to develop in your work? Did you ever have a musical background? If not, do you ever listen to music while you work? That aspect of my work, in the pieces where I use the marking tags and text, comes directly from my interest in the sound patterns of language, rather than from music. Each language has its own patterns of construction; of sequencing vowels and consonants that constitute syllables, words and larger units of meaning. When I create one of these text-generated pieces, I mark specific groups of vowels or consonants, or nouns, verbs, conjunctions, etc. 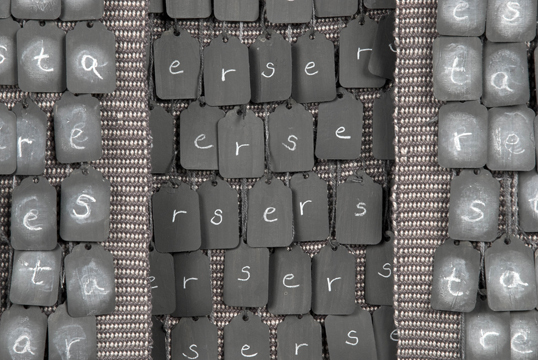 The patterns of the marking tags thus foreground and highlight the underlying patterns of the grammar. On that note of rhythm, there's an element of time in your work as well. The erasing be that from the walls of the installations to sometimes on the tags themselves give this feeling that change was made, edits, alterations allowing us as viewers to see a process, as if the final thought was unfinished and developed as you worked. Can you talk a little about that aspect in your work? Why is it important to be actually erasable vs simply appearing to be as an aesthetic choice? Unless and until we commit language to print, or some other “permanent” medium, we naturally edit and alter how we speak, sign, write. Erasure speaks to this way of approximating an idea, of successive attempts to get closer and closer to having words express what is in our minds. For me, the fact that the work is not “fixed,” suggests, too, that infinite future alterations are possible. On alterations, you clearly have a love for thread and textiles. The repetition and linear aspects of both writing and textiles really do go hand in hand and play off of each other wonderfully in your work. How did you first come about bringing these two things together? Can you speak about the particular meaning when combining these elements in your work? Yes, as you note, language and thread have been closely associated across many cultures. There is a rich history of exploration of this association by many artists. Anni Albers and others have written about the ability that thread has to communicate. I love the sensitivity of a line of thread, as well as a line of handwritten text, and the way that both reflect the hand of their maker. Text and textile, are, of course, etymologically related, and come from a root that means “to weave.” Writing and reading thus carry with them always the idea of weaving. 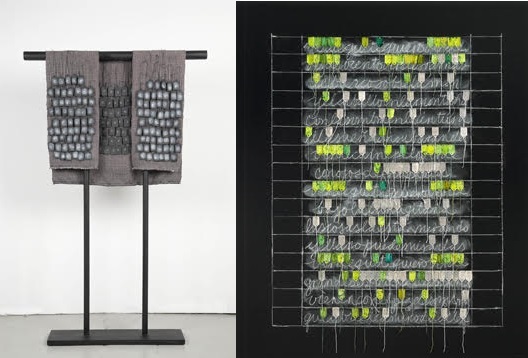 Once I began to seriously look at the many connections between textiles and language, it led my work in new directions. Lastly, let's discuss color, or the lack of it quite often in your work. At what point of the creative process do you make those decisions in your work? Is the text and layout sketched out first then color applied (or not)? 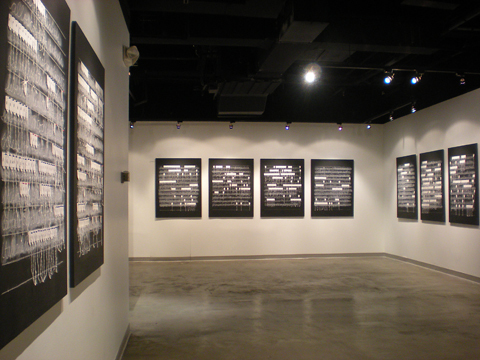 Can you go into more detail about the tags specifically and how they interact and punctuate the work? I began the “marking” series predominantly in black, white, and gray, as a challenge to myself to make the work with as few elements as possible. In more recent pieces, I began to incorporate color to reflect some aspects of the “semantic layer” of the text. Thus, the works incorporating Gertrude Stein’s “a rose is a rose” are marked with red, pink, yellow, and orange tags. Sometimes I have a color idea before I choose the text; at other times, the text comes first. And the text itself suggests ways of highlighting aspects of its grammar. I love the fact that the tags I use are called “marking tags,” and enjoy the rich associations the term “marking” carries, in both linguistic and visual fields. Each tag is pinned to a specific place in the text, marking a sound or a word. This is why I use map pins: to point to a location in the text. It is difficult to name only three of the many artists who have influenced and inspired me, so I will start with the letter “A”: Anni Albers, Agnes Martin, and the many generations of Andean artists who for centuries have created brilliant, beautiful, and complex textiles. Do you have any upcoming shows or events that you'd like to share? I am creating a new piece that I began with community help at AS220’s Foo Fest in August, 2017. The finished work will eventually be installed in the “Open Window” outside AS220’s Empire Street Gallery in Providence.